Valentine’s Day is less than a couple weeks away! Finding the perfect Valentine’s Day gift can be hard, especially since time is starting to run out. However, with some Valentine’s Day Candy and some basic supplies, you can DIY a gift for that special someone! Make a pretty presentation of Valentine’s Day Candy by making a candy bouquet! All you’ll need is individually wrapped candy, skewer sticks, ribbon, vase filler, and a vase. Use this tutorial to craft the perfect bouquet. Or if your valentine is more of a baked goods type of person, most Valentine’s candy can be added to baked goodies. Chocolate heart brownies, decorated cookies, or even a cake decorated with colorful candies is sure to please! Check out the links above for more ideas. 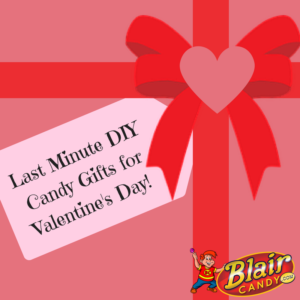 Be sure to visit BlairCandy.com for all of your Valentine’s Day candy needs.